The University of Louisville School of Music is pleased to be the home of the Jamey Aebersold Jazz Studies Program. Established in 1985, the program was named for Mr. Aebersold in 2000. Mr. Aebersold, a 2014 National Endowment for the Arts Jazz Master recipient and retired faculty member, is one of the leading proponents of jazz education and largest publisher of jazz education materials in the world. Additionally, the School of Music has hosted the Aebersold Summer Jazz Workshops since 1977. The Jamey Aebersold Jazz Studies Program is recognized throughout the nation and world for its commitment to quality and innovative programs. Jazz degrees include a Bachelor of Music with an Emphasis in Jazz Performance. This degree will offer students a complete undergraduate jazz experience. Our newest degree is a Bachelor of Music Education with a Jazz Track. This one of a kind, highly innovative degree provides a comprehensive jazz experience while preparing the individual to teach in the public schools. Our Bachelor of Music with an Emphasis in Music Therapy with an optional Concentration in Jazz is an excellent experience for any music therapy student who is interested in jazz. We also have a Bachelor of Arts with an Emphasis in Jazz Studies. This degree is designed for the student interested in a diverse educational experience while developing their jazz skills Master’s degrees include a Master of Music with a Concentration in Jazz Performance and Master of Music with a Concentration in Jazz Composition and Arranging. Each gives the student a focused jazz experience in the Master’s setting. Scholarship assistance is available for graduate and undergraduate students wishing to focus their study in jazz. The program features extended residencies by leading jazz artists, as well as a continuation of the exciting annual Jazz Week every February, which features a week-long celebration of jazz with concerts, workshops, and clinics. 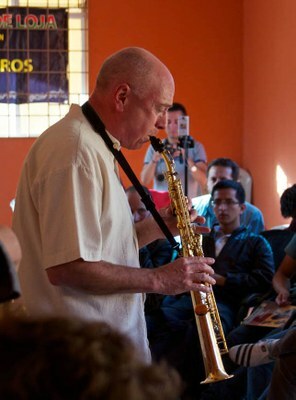 Founded in 1992, Jazz Week, now known as Jazz Fest, is an event that regularly features some of the biggest names in the jazz world The Jamey Aebersold Jazz Studies Program is active in international exchanges with leading institutions from around the world. Student and faculty groups, from a duo to more than forty, have toured and performed in numerous foreign countries. Recognize as leading educator/performers, the prestigious faculty frequently presents clinics, master classes and performances at schools, universities, civic organizations and conventions throughout the United States. Please feel free to explore our web site for additional information on our students and faculty, classes and ensembles, degrees and residencies, national and international outreach.